Cedar Rapids, Iowa (June 14, 1977) - Dueling Stock Cars. An old tune put to different lyrics. And to say that the 28 cars that started the fifth annual Falstaff 100 Tuesday night at Hawkeye Downs dueled furiously and intensely is a vast understatement. Marion's Fred Horn steered his sleek 1977 Camaro to the checkers abut a car length in front of Waterloo's Bill Zwanziger to put the finishing touches on a dazzling stock car program that delighted 6,500 race fans. 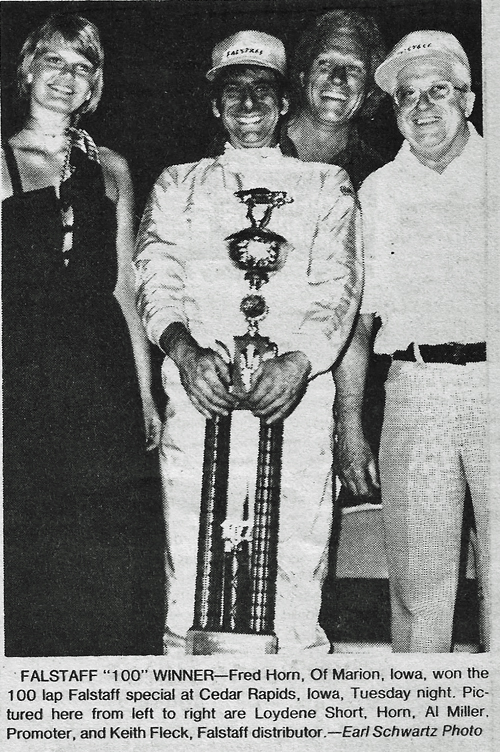 “I just wanted to run flat out and the car performed,” breathed Horn after outlasting Zwanziger's 1977 Nova in a heated battle that went bumper-to-bumper and side-by-side for the final 30 laps of the 100-lapper. Kalona's Mike Niffenegger won the pole position with a 24.76 lap in time trials, but Zwanziger, a former Falstaff winner, moved to front on the second lap. That changed one lap later when defending champion Curt Hansen of Dike took over and led until Zwanziger took over on the 35th tour. And while the record crowd feasted on the front-running action, Roger Dolan of Lisbon and Bill Rice of Des Moines were steaming like there was no tomorrow. Dolan started 16th, but was running fifth on the 35th lap. That was just one lap before Waterloo's Ed Sanger, another former winner, went to the pits with engine problems. Sanger was driving his backup car. Rice started even farther back, 19th on the grid, and he maneuvered relentlessly until finally moving into his eventual fourth-place finishing spot on the 94th lap. Dolan opted for tile high groove from the beginning and had pedal to the metal until he went around Zwanziger on the 60th lap. The Lisbon veteran was making a run at Horn going into the second turn on the 69th lap when he spun out and lost six positions. He came back to finish sixth. Rice was racing for the fifth straight day and arrived late Tuesday night after pulling almost 500 miles from Fargo, N.D., where he won $1,100 for winning a special Monday night. Bill can temper his worn-out feeling when he totals up his earnings since last Friday night. In the money at Boone, Mason City, Des Moines, and Fargo and then in the Falstaff, his earnings total $2,930. Mike Frieden won the 20-lap consolation and picked up $200. Pit Stops: Lisbon's Roger Dolan wowed the crowd of course, with his brilliant drive from 16th and after cooling off with a beverage after the 100-lapper mused, facetiously, “That's what I get for driving so conservatively.” On the 59th lap, Dolan scraped the wall in the back stretch and sparks flew, but in the process passed Curt Hanson into second place behind Horn . . . Most observers were amazed that 10 cars all finished on the same lap, let alone go the entire 100 tours. “It was amazing,” said veteran race announcer Tony Dean, now of Huron, S.D., “that 21 of the 28 starters were still racing at the finish.” Dean got his start announcing races at various Eastern Iowa tracks.